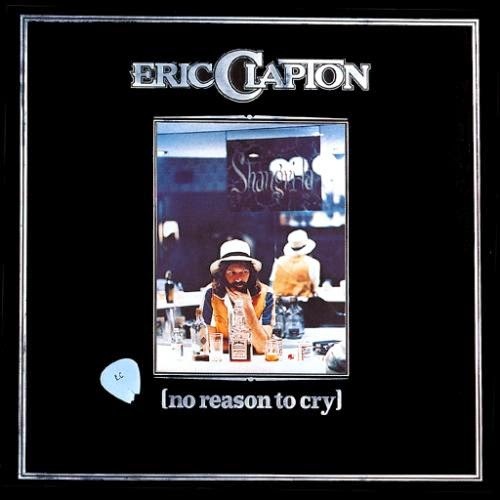 Spinning on the turntable today in the 'rock room' is Eric Clapton's 1976 LP No Reason To Cry. Highly underrated in the spectrum of Clapton's catalog, the record contains a plethora of special guest musicians, co-writers and friends lending to the boozy celebratory vibe of the record. Recorded at 'The Band's' Malibu clubhouse 'Shangri La' studios, the record offered Clapton his long standing wish to become a default member of 'The Band'. 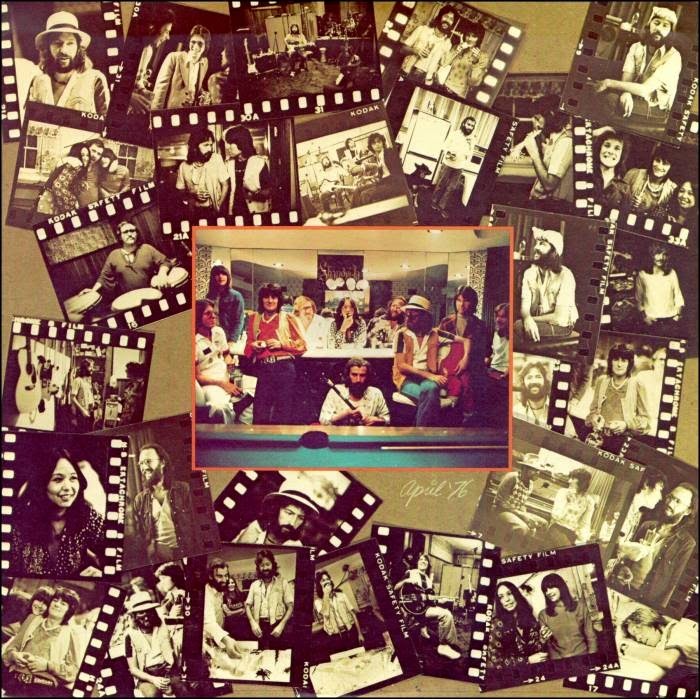 All members of the 'Band' appear on the LP in some form as well as Clapton cronies, Bob Dylan, Jessie Ed Davis, Billy Preston, Ronnie Wood, George Terry, Georgie Fame, Yvonne Elliman and Marcy Levy among a host of others. The famous story that emanates from these sessions is of Bob Dylan camped out in a tent at the bottom of a hill near the studio and popping in to offer musical assistance or songs to Clapton. These were heady days never to be witnessed again, resulting in a recorded document of friendship and collaboration featuring the some of the most respected musicians of the time. It's a low key affair, light on guitar fireworks but stewing with a smoky and boozy soul. Soon, Clapton's next LP, 1977's Slowhand would overshadow this particular record, producing three huge singles and rocketing up the charts. So, No Reason To Cry remains a clandestine member of Clapton's discography; birthing only one Top 40 single, his fourth solo LP stands a wonderful collection of good time music, drenched with Jim Beam and soaked in comradery. It has some soft spots, but the payoff is worth the wait. While only containing three true Clapton compositions, the LP still contains some gems. Co-produced with long time Clapton comrade Carl Radle and Band associate Rob Fraboni, this is the record that had to be created in order for Clapton to make the next natural move in his career. The record begins with the Manuel/Danko composition 'Beautiful Thing' originally composed around 1966 in the late days of 'The Hawks' and the formative days of 'The Band'. There is a delicate and beautiful demo recording of the track on 'The Band's', A Musical History box set coming from 1966 which illustrates the songs early beginnings. Unfortunately, Manuel or Danko could never shoehorn the song onto a 'Band' record, holding on to it for ten years until Clapton used it for the opening song on his own record. Churning on a instantly recognizable Richard Manuel piano melody the music drips with watery lament, dressed in overlapping slide guitars and secular organ lines. The chorus is sung by the collaborative ladies visiting the studio eliciting all of the emotion from Manuel's original intent. Clapton's whiskey and cigarettes voice is the proper fit for a song that precariously balances on hopefulness and loneliness. 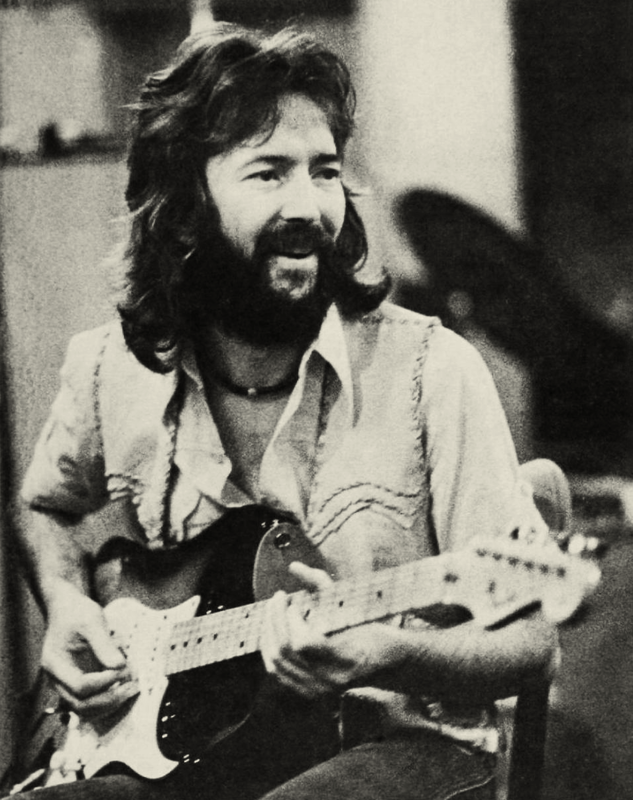 Clapton would fulfill his wish to become a member of his favorite group with the multiple collaborations with the principals of 'The Band' on this record. Ronnie Wood and E.C. both play dueling slide on the track, intertwining their licks into a cloudy swell. The second track of the record is a jumpy fairground calliope of music, with the Clapton composition, 'Carnival'. The song opens on a shouted 'Oye!' that sounds suspiciously like Ronnie Wood. Settling into the groove of what would later be mined for 'The Core' on 1977's Slowhand, 'Carnival' is comprised of flashing organs, chunky rhythms and expletive percussion. The lyrics are very simplistic, an invitation for a chosen lady to take a late night night to walk through the midway. Not Clapton's finest lyrical moment, but the song is more about the groove than any deep philosophical content. 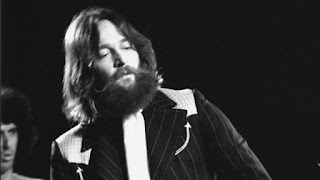 The construction of the song illustrates the upcoming musical developments and approach developed on future Clapton releases. The acoustically rooted Bob Dylan composition 'Sign Language' follows next and is a charming result of Dylan's visits to the recording sessions when leaving his tent. In typical Dylan fashion the song places the listener into a developed scene with minimal effort, highlighted by Robbie Robertson's fluid guitar work and flexing tremolo bends.The rhythm track shifts with bellowing acoustic rhythm and syrupy dobro slithering.The solos are an absolute chill inducing blend of swells, picked harmonics and plucky punctuations. 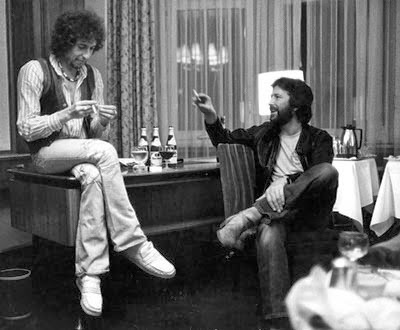 Dylan and Clapton share lead vocals (no easy feat) encouraging the mind image of them standing at the microphone arms around one another, bottle hanging by their side. Dylan's vocals still retain the 'Rolling Thunder' era push and are a highlight to crane an ear for. The bluesy stomp of the Alfred Fields song 'Country Jail Blues' originally released in 1941, follows and finds Clapton at home with a straight blues stomp. The song would stay with Clapton for years, making an appearance on stage during his 1994 Blues tour. Here it is Clapton's comfort zone, a straight forward campfire blues, shackled ankles and black and white stripes. The song swings on what sounds like heavy left hand Richard Manuel piano and multi-tracked electric and wooden slide guitars. Billy Preston's organ underlines Clapton's sing/speak vocal approach and his dagger sharp guitar solo. The first side concludes with another fine collaboration with a member of 'The Band'. The song, 'All Our Past Times' is a co-written number by Rick Danko and Clapton which would later be revisited during the 'Last Waltz' and performed by Clapton with the 'Band'. The song is unfortunately tucked away at the end of side one on this often forgotten LP, but did end up with some longevity. Toward the end of his life Danko would resurrect the track for one of his own solo recordings. This is a straight up 'Band' song minus Levon Helm, featuring Eric Clapton and full of sensitive playing and a reflective ambiance. Danko and Clapton trade lead vocal duties and Robertson and Clapton flip guitar solos on this song that reflects on the forging of deep and lasting friendships regardless of the passing of time. Golden. Side two in my humble opinion is slightly inferior to the first, but still contains fine moments of note. 'Hello Old Friend' is the big single from the record and is a good representation of the sought after sound of the LP and the direction in which Clapton's music was traveling. A harmless but very catchy song, 'Hello Old Friend' welcomes the listener with hearty backing vocals and a cascading chorus piano. A positive beginning to side two of the record for one of Clapton's more recognizable numbers. Soon to become a concert showcase of Clapton's, 'Otis Rush's 'Double Trouble' follows and again finds Clapton with the seat back, driving the blues to his true home. This studio reading is no slouch exhibiting a shredded vocal attack by Clapton and a smoke blue backing. This song also features the first 'big' soloing of the record with Clapton exhibiting his usual form. The rendition is a highlight of side two without a doubt. Clapton then introduces collaborators for the next two songs, the Marcy Levy/Clapton penned, 'Innocent Times' and the Sims/Levy track, 'Hungry'. Levy sounds invested and powerful on 'Innocent Times', a slow waltz and country swing that suits her voice well. The following tune, 'Hungry', while containing interesting instrumentation, sounds too much like a poor rewrite of 'Keep on Growing' from Layla and Assorted Love Songs to these ears. Check it out and decide for yourself. The album closes with the unassuming Clapton deep cut, 'Black Summer Rain'. Clapton reveals the Richard Manuel influence by singing in a sweetly strained falsetto. The lyrics are direct, pastoral and self deprecating. The song contains within a slightly extended outro jam that contains crisply understated and taffy sweet riffing played by Clapton. The organist contributes some cinematic and swirling church organ that drives Clapton to even greater heights. (it sounds like Billy Preston to me) The album certainly redeems itself here, (if it had to) by closing with a smoothly inspired and slightly 'lost' classic. The 1976 LP No Reason To Cry was a communal attempt by Clapton and his associates to make a great record while still helping to define the next direction in his career. The record works in some spots and struggles in others. What cannot be denied is the soulfulness of its best songs. The collaborations are timeless and the' music as therapy' approach is tangible. Clapton would soon be approaching greater fame and dealing with more intense struggles. But for these captured musical moments it was all about 'work as play', with mostly positive results. Worth searching out alone for the diverse combinations and unique approaches contained within.